The Wildness That Courses Through Languedoc Reds – GARGANTUAN WINE. There’s a 400 lb monster that rustles through the garrigues of the Languedoc, a snarling, horned beast with an appetite for grapes. Surrounding your vineyard with electrified wire helps a bit, but ultimately, you can’t be present day and night to protect it. Only solution? Call in the hunters. A great deal of the Languedoc is still an untamed, wild place, especially near the Cévennes National Park, where these wild boars roam. Unsurprisingly, the wild boars wander down from the forest into vineyards; and perhaps equally unsurprisingly, this wild side of Languedoc terroir wanders into the wines — particularly the red blends. Consider Jean-Marie Rimbert’s Saint-Chinian ‘Le Mas Au Schiste’. I’ve consumed cases of this wine over the years, and always wondered exactly what accounted for the unique, savage aromas that course through it. 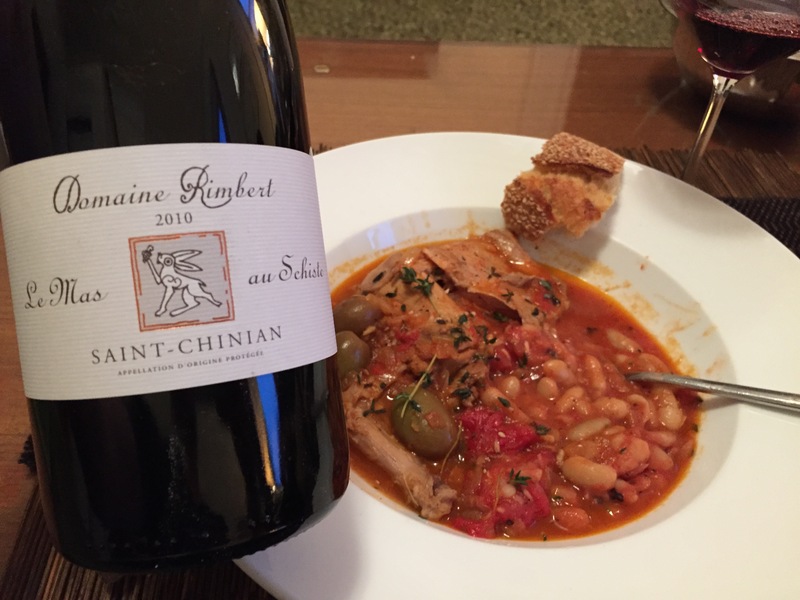 2010 Domaine Rimbert Saint-Chinian Mas Au Schiste, with Provençal rabbit and garlicky beans. The 2010 Rimbert Saint-Chinian Mas Au Schiste brings to mind fading roses, bitter chocolate, sweet candied fennel, celery leaves, plums, and bits of green olive. It’s a unique and delicious wine, a seriously ageworthy bottle that typically improves over five years and sells for a paltry $20. The wine is 35% Carignan, 30% Grenache, 30% Syrah, and 5% Mourvèdre. I’d always suspected that the candied fennel, celery leaf, and green olive aromas were thanks to Carignan, as that was the only departure from the familiar taste profile of more common Southern Rhône red varietals (GSM: Grenache, Syrah, Mourvèdre — a formula recreated the world over). Turns out they were indeed due to Carignan, but that Carignan brings even more than that. Thanks to its naturally high acidity, outspoken tannins, and herbal notes, Carignan contributes a much-needed freshness to these blends, which helps cure the “Southern syndrome” — overly-fruited, debilitatingly alcoholic wines marked by Grenache and Mourvèdre, a syndrome just as troublesome in the Southern Rhône as in the Languedoc. Late-ripening Carignan grows throughout the scorchingly dry southeast of France; nearby northeastern Spain is its ancestral home. But even if Carignan still grows in pockets of Spain (Catalonia and Priorat), California, and Sardinia, the Languedoc is its irrefutable adoptive home, with 42,000 hectares planted — seven times that of than Spain, or anywhere else1 in the world. A key to understanding the Languedoc — its terroirs, its wines, its history — is contained in this single, woefully misunderstood grape. Grenache, Syrah, and Mourvèdre together must represent 60%. No single component of these three may exceed 75%, nor be less than 20%. Cinsault may not represent more than 30%. If Carignan is included, then Grenache may not be less than 20%. Looks like Carignan needs a fruity handler: Grenache! But why exactly does the Languedoc fear Carignan? It all goes back to Languedoc’s historic role as a producer of high-yield, lower quality bulk wine. The wine that fed supermarkets with low-cost options, and turned off French and other European consumers alike, birthing what became known as the wine lake. A lake overflowing with juice from the high-yielding Carignan grape. Here’s the thing with Carignan: it behaves a bit like Sauvignon Blanc, and grows like mad. To be worthwhile and avert an undesirable degree of vegetal character, you need older vines growing in a properly selected poor soil, and you need to cap yield at 5-6 bunches per vine of Carignan. During the wine lake era, growers let their high-yielding Carignan run wild with 12-13 bunches per vine. 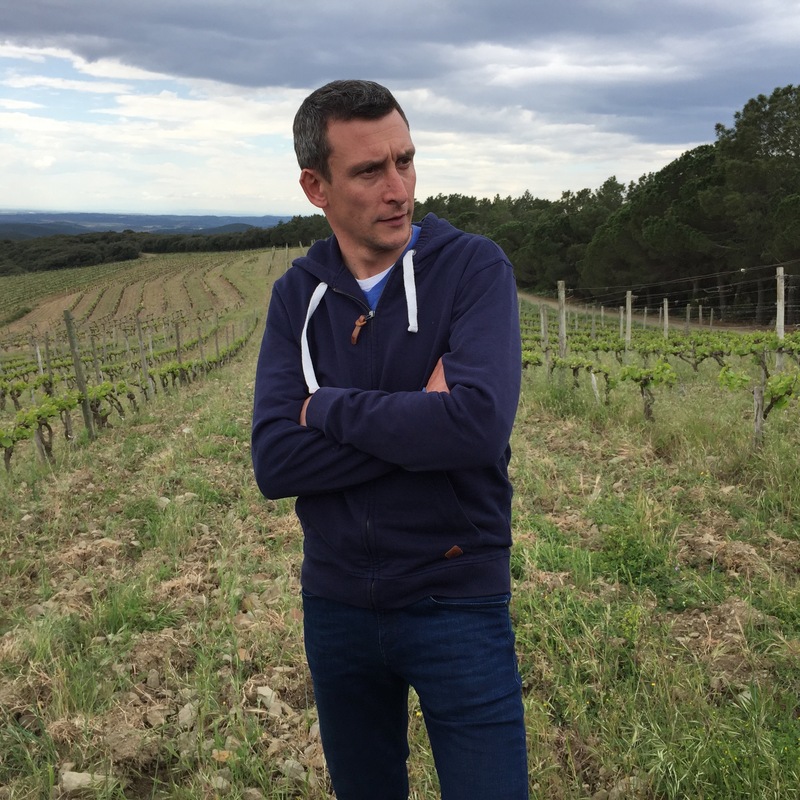 Once cheaper New World wines began competing with the Languedoc’s high output, growers needed to up their game, and quality became the new goal. Brussels looked down their bifocals from their balance sheets and decided that the Languedoc needed to reduce the amount of wine it produced rather than continue annual EEC or EU subsidies to convert unneeded wine into unneeded alcohol4. And so in the aftermath of the wine lake, Carignan was branded as the enemy. The EU and the French Ministry of Agriculture encouraged growers to tear up Carignan and plant profitable Syrah and Grenache in response to perceived demand. These varieties were called cépages améliorateurs; they would improve5 the region’s wines, and help lift struggling Languedoc growers out of the wine lake. Hordes of growers ripped up their Carignan during waves of EU monetary incentives from 1976-20076. Centennial vines were torn up: aging giants sacrificed at the altar of progress. Many of those vines were my friends! However, if the quality of Languedoc wines rose in the 1990s, it was more thanks to an exacting younger generation of winemakers who were laser-focused on deciphering their terroirs than to the suppression of Carignan. But then something unexpected happened: winemakers began to look at their blends differently, and wondered just how they were unique. One of the ways the Languedoc is unique is without a doubt the surprising assortment of terroirs it harbors. Once you see the landscapes, you understand the invasion of foreign winemakers racing into the region to buy severely undervalued land; gentrifiers who will — if all goes well — help drive up values for their purchased hectares. But, terroir considerations aside, at some point, a younger generation accepted that Carignan is an essential, historic component of their parents’ red blends. Carignan is a wonderful varietal, capable of rendering beautiful wines in the right hands, and it is part of what makes Languedoc reds unique. Thankfully, during the EU-incentivized uprooting party, not everyone sacrificed their Carignan. The winemakers who’d refused to tear up their low-yielding, old Carignan vines now find themselves in possession of a coveted asset. Francois Vidal, Château de La Liquière, in Faugères. Why such a coveted asset? Because in the last five years, lo and behold: everyone’s planting Carignan again7. But there’s a problem: given demand, you have to order vines 1-2 years in advance from nurseries. Carignan is an irrepressibly rustic grape that resists ornery, Baroque dressing-up in the same way an elephant resists pedicures; it does not want to have anything to do with new oak, and come what may, it’s going to express its nature. Which is why it’s so great; you can’t take Carignan out of the Languedoc, nor should you. You shouldn’t seek to erase the unbridled wildness in these wines; it’s what makes them unique and quite often renders them drinkable. Setting aside the Grange des Pères and Mas de Daumas Gassac — two UFO-like8 wines which occupy their own unique roles in the history of the region — all of the red wines which helped build the Languedoc’s renown and drive up prices fetched by the region’s wine were built on Carignan: Mas Jullien, Maxime Magnon, Domaine Léon Barral… the list goes on. 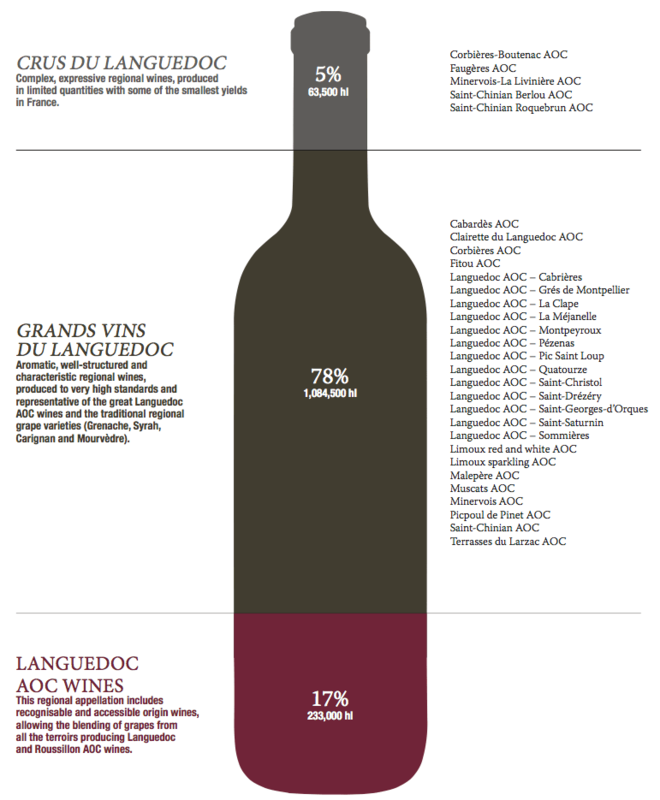 Languedoc’s new tripartite AOC quality pyramid. Staunch defenders of Carignan also often ‘downgrade’ their potentially AOC wine to an IGP Pays d’Oc (Pays d’Oc Protected Geographic Indication) wine by using their old vines to produce a 100% Carignan wine, or, instead, retain AOC status and feign inclusion of 5% of a different varietal — in speaking with a few winemakers, more than one privately conceded that they didn’t bother adding a second varietal. These wines are the purest expression of Carignan, and a retort to those who would slander it. They show a wide range of countenances: the wines may be regal, lean, supple and inviting to overly fruity, too sun-ripened and alcoholic, or perhaps brash, vegetal and acerbic all the while remaining wholly gulpable and appetizing. The finest 100% Carignan I’ve tried was the 2012 Domaine La Terrasse d’Elise ‘Le Pigeonnier’ IGP Pays de l’Herault, sadly unimported to the United States, and thus available only to the few connaisseurs in the south of France that know of former lumberjack Xavier Braujou’s unbelievable single varietal wines. What a lovely, regal wine; even in its polished, lighter-bodied pure fruit and supple leanness, it still retained that quintessentially wild, Carignan character — one that the Languedoc must celebrate rather than suppress.